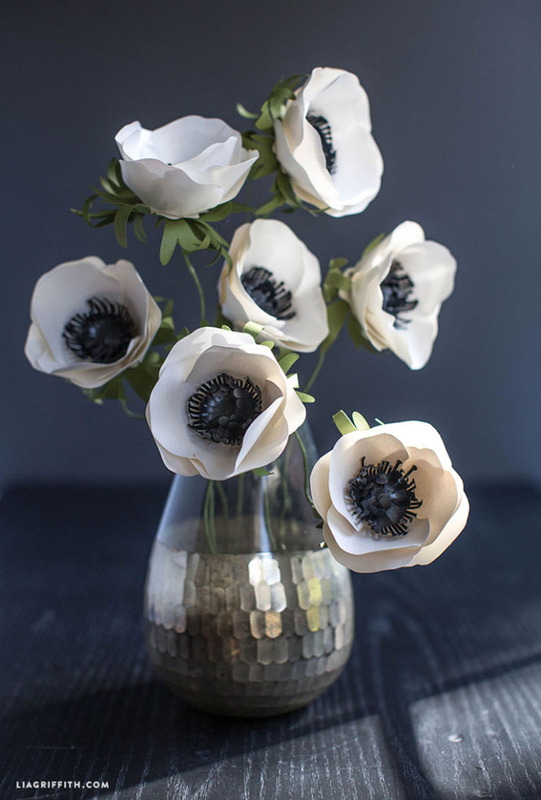 We all agree at Lia Griffith HQ, that this anemone is one of my best paper flower designs to date. 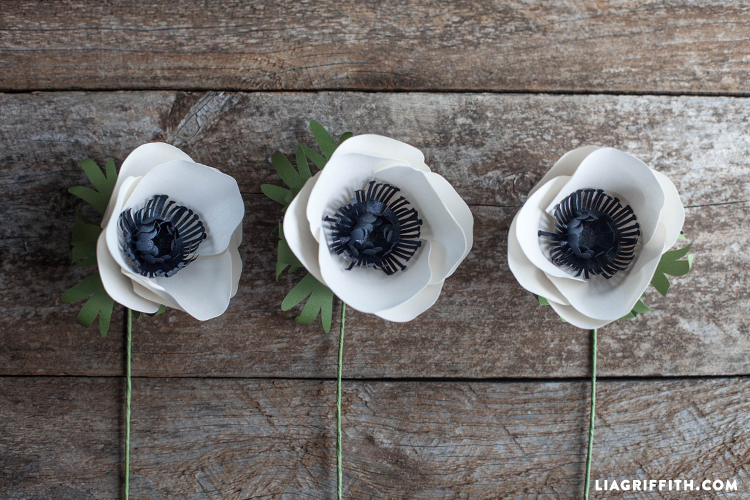 My past designs include a watercolor print anemone, a tissue paper anemone and a felt anemone. 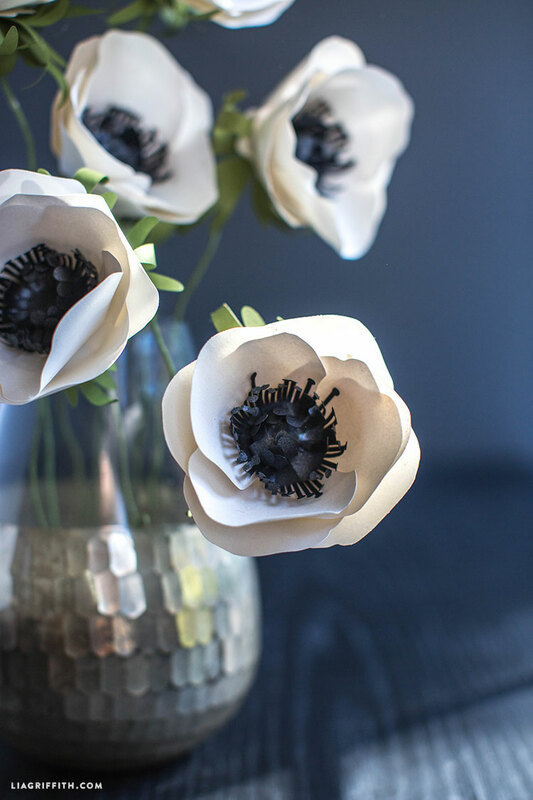 I do have a crepe paper anemone on my “to design” list. This pretty flower is simple, classic, yet is so detailed. 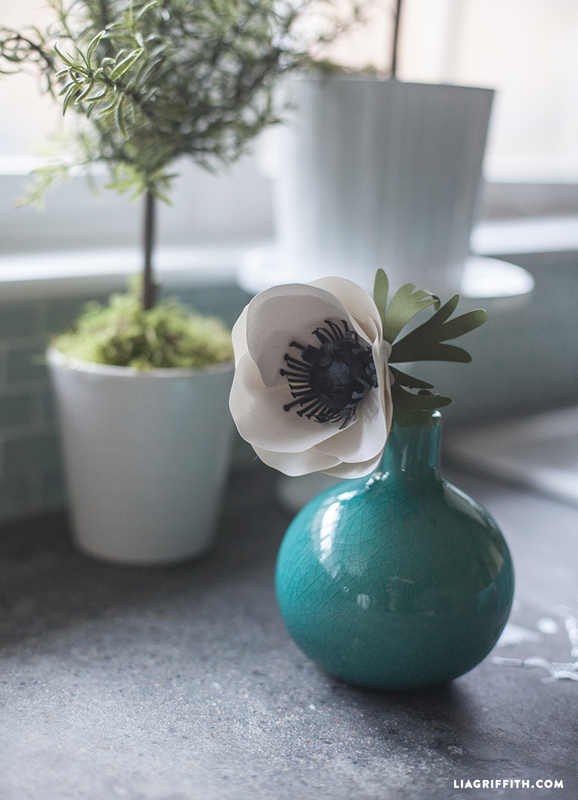 You may remember this flower sitting on my counter in my kitchen tour. 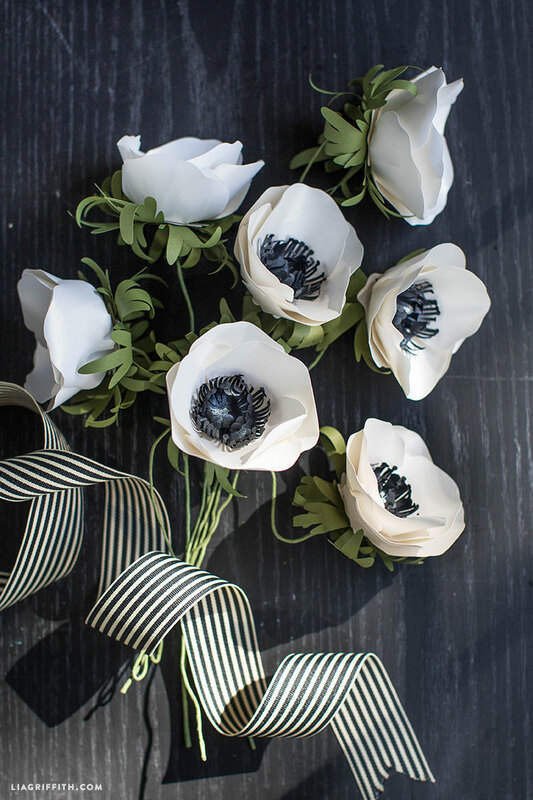 The contrast of the paper colors along with the intricate centers of each bloom set this paper flower above the rest. It makes the perfect DIY wedding flower for it’s formal yet delicate appearance, yet it looks just as wonderful sitting in a vase on my kitchen worktop. 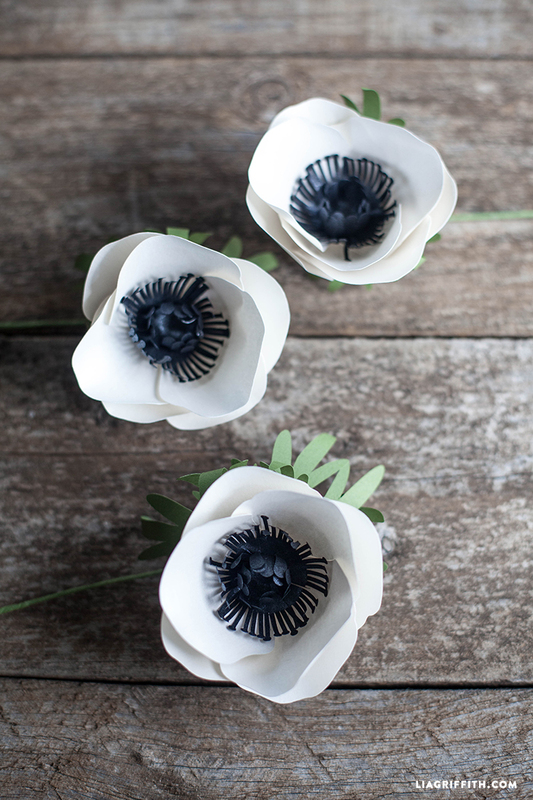 Of course, as with all my paper flower designs, it is absolutely possible to make this project in any color of paper. I like to use a metallic pale pink with a metallic black paper for the bloom and a deep, matte green for the leaves. 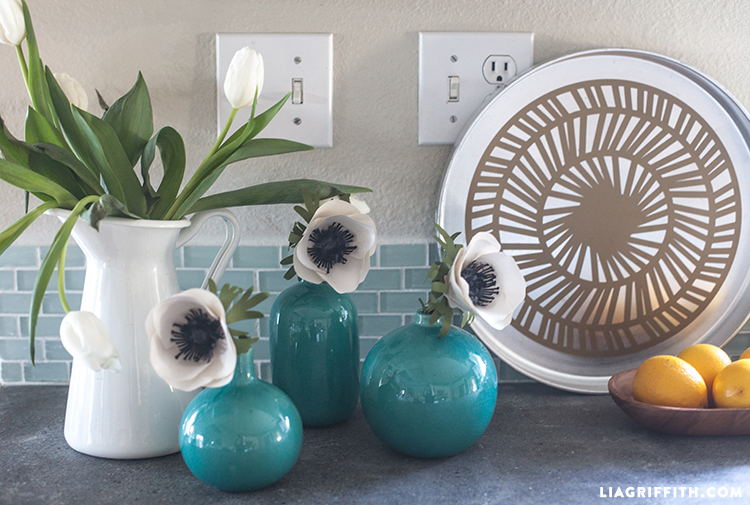 Match this green with the green of your floral tape for a more natural look. 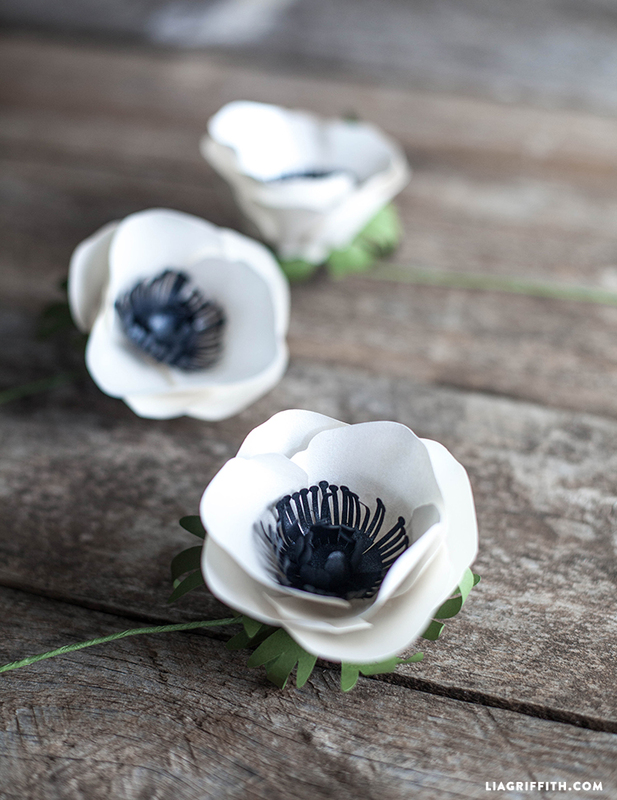 Love the Wedding Collection with the Aneome flowers. I downloaded the cut files for the flower to make a couple of corsages for a retiree dinner our company is having as I’m using the changeable .pdf to place at each place setting for a keepsake. The .svg file will not let you separate the cut lines for the flowers. They act as a single unit and you can’t get in there to delete them or perhaps copy and paste ONE set so you can fix the file. It will not print on 8.5 x 11 paper and it will not let you change it to 8.5 x 11 after you send it to “make this project” using the “edit” command. Believe me, I tried everything as I am very persistent when it comes to making something work lol. (i.e. you can’t even “attach” one set of lines to one flower then duplicate the correct number of the combination to fit on 8.5 x 11 paper). I ended up wasting a lot of my beautiful, new text weight paper I ordered from Paper-papers.com. (love, love, love this paper – had only worked with cardstock until last week!) Let me know if you will be able to fix the file so I can download the correct version. Thanks so much for all you do! Hi Kim, thank you for letting us know about this! For some reason, some of our older SVG files aren’t importing properly to Design Space since their software update. We’ve caught a lot of them but sadly not this one. Hopefully you can still use the petals and cut the slits yourself?! I’m sorry for the wasted paper 🙁 The new file is up and should work fine. The petals will not print on 8.5 x 11 paper. The SVG file is not set up to allow a change to the paper size or to move some of them to a new mat. Thanks. I mean cut not print. I don’t know how to fix it as I’m pretty new to cricut. Hi Melissa! You can change your paper size once you’ve hit “Make It”. However, the SVG file will upload with everything as a group so if you want to ungroup anything, just Select the layer “NEWAnemone”, then hit “Ungroup”, and the petals will be on their own layer. Hope that helps! hello i am new to cricut so i wanted to know if you could tell me how to find the template to cut out in the design space? or if i will need to download your template? Hi Gail! I’m not familiar with the Sizzix software but the petals should be about 3.5″ wide, so hopefully you’re able to resize! 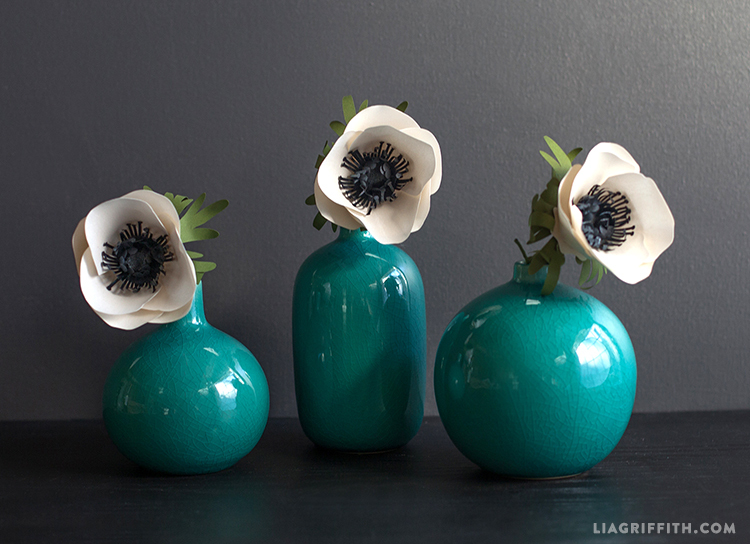 Dear Lia: I am a total newbie and want to try this project. Are the tabs scored or cut? How did you make the black centers on the flowers? There is a tutorial at the end of this post. I did cut mine on my Cricut Explore. I am planning on giving these s shot for our wedding in July. Can you recommend a Cricut machine that wouldn’t break the bank, but work with this project. I am intermediate crafter, but novice when it comes to Cricut. I would recommend the Cricut Explore One! It is their most basic current cutting machine, but still has all the capabilities you would need. The Explore Air is the higher-shelf product because it is wireless and also has two heads for scoring and writing at the same time, but these features aren’t necessary for the projects that I make 🙂 I would recommend browsing ebay or craiglist to see if you can find a deal before buying from the website! They are also sold at Michaels in a bundle that I specifically created with 30 exclusive projects that are not even featured on my site 😉 Whatever you end up doing, I would say to definitely not buy the Cricut Expression. It is an older model of theirs that only works with cartridges- you aren’t able to upload any external files. Good luck!! Thanks! Will defiantly check out all the options that you mentioned. I can’t wait to see if I can make them just as beautiful. If you are still looking, I found a cricut explore one at Walmart on clearance! Just another place to look. You can also get them from Bed Bath and Beyond and use the 20% off coupon! You can get cutting supplies on Amazon Prime and they’re much cheaper than in craft stores. The machine isn’t cheap but it is absolutely worth it. Use it for as many things as you can and it’ll pay for itself in no time. I was able to download it to Design Space with no problem. Hi Lia, When I tried to upload the SVG file on the Cricut work space I was unable to do so. The following popped up: “The uploaded SVG contained the following items that are not supported: Text Elements.” Is there a way around this?